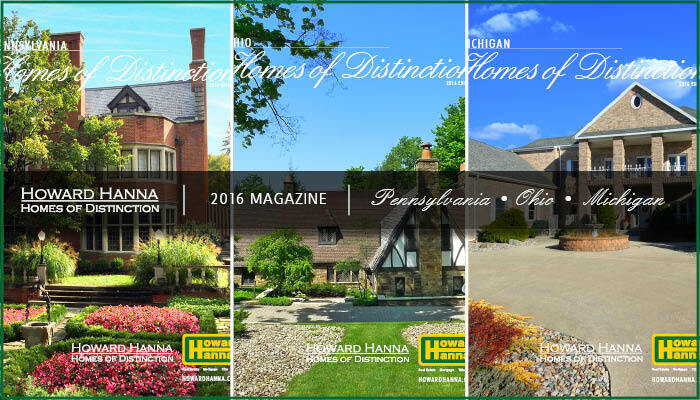 Pittsburgh, PA (December 8th, 2016) – Each year, Howard Hanna Real Estate Services creates a captivating magazine for its Homes of Distinction program. The yearly magazine brings together buyers and sellers in a unique way, featuring listings of $675,000 and above. We are honored again in 2016 to share some of the best luxury homes on the market. This year’s Homes of Distinction Magazine highlights exceptional characteristics of high-end homes in Pennsylvania, Ohio, and Michigan. Each page of the magazine provides an appealing insight into the world of luxury real estate. Howard Hanna Real Estate Services is the third largest real estate company in the nation and the leading brokerage in luxury home listings in Pennsylvania, Ohio, and Michigan. The company launched its exclusive Homes of Distinction program to best serve buyers and sellers with high-end needs, helping set the company apart from other luxury brokers. With nearly sixty years of experience, an impressive market share, and an international affiliation with Luxury Portfolio International, it’s easy to see why many discerning buyers and sellers choose the Howard Hanna Homes of Distinction program. Searches for high-end homes on the Howard Hanna website number nearly 30,000 annually, allowing us to bring our Homes of Distinction to a wide and diverse audience. The exclusive program provides tailored services reaching affluent audiences nationally and internationally. Included in the program are benefits such as coordination of a customized marketing plan, a URL tailored to the property, direct mail, email outreach, plus more. Additionally, participants qualify through our exclusive relationships for other benefits, allowing clients to reach a broad audience for their properties.